Wow - Thanks for the kind words! "You're the best of the best." As a high level athlete your body receives all of the positive benefits of training, however, there is a lot of wear and tear on your muscles and ligaments. To be honest, getting in my workout daily and making sure I have time for everything else leaves little time for stretching and foam rolling. Integrating ROLFING with Dani into my weekly regime has made my body "happy" again. After going through the 10 series with Dani, my muscles feel longer and my posture has improved immensely. I have sent many friends and clients to see her as this amazing technique is a total body-changer. I had seen other "ROLFERS" in the past, but Dani's approach has been a lot more soothing and gentle as well as being very educating and knowledgeable while working on your body. ​ I honestly think she has "magic hands". Thank you Dani....my body and I thank you!
" Dani tackled a long standing tailbone issue I was having and provided a great deal of relief. She listened with love, explained the physiology with knowledge and applied her craft enthusiastically. It's apparent that this is a passion and anyone looking for an emerging type of body work would be lucky to be in Dani's capable hands. Your posture will thank you! " 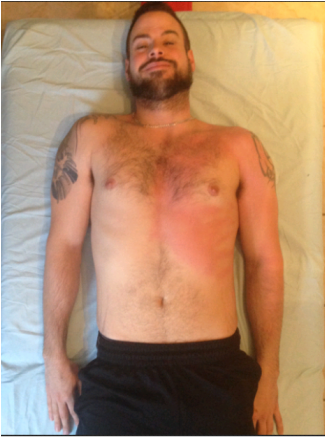 ​" Just finished the ten series of Rolfing (structural integration) with Dani Reid and it literally changed my life. This photo is before we started and after seven sessions. My body is realigned and I feel like a new person. Thank you for you amazing skills and beautiful spirit Dani! " I had originally booked an appointment with Dani to correct some issues I was having with my shoulders. I had started training for a bodybuilding show and my one arm had limited range of motion and didn't follow the same path as the other. Not wanting to develop and asymmetrical physique, I started my series with Dani. After 1 session, my ROM had returned so I kept up my sessions throughout my contest prep. As the show neared I incurred 3 bad hamstring tears and feared I'd have to drop out. Dani helped rehab my legs and my leg training resumed a short while later. 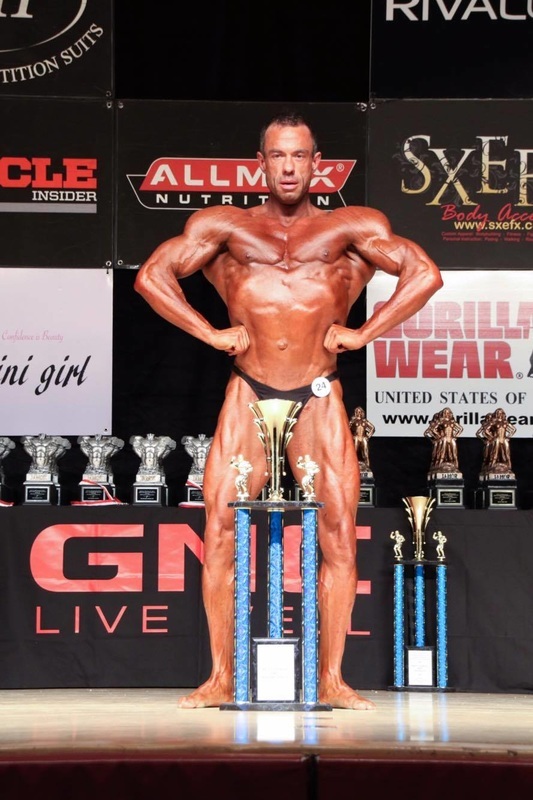 I'm happy and proud to say that Dani helped me fulfill my dream of competing...then winning the Masters and Open Overall trophies at the Stratford Festival City Bodybuilding Championships this year. THANKS AGAIN DANI!!! " " Last night I had my first session of structural Integration done - wow! I have no words to describe how I felt and feel today. The picture shows how much stress I was carrying in my shoulders and a change in my posture at the end of the session. I was amazed at the results, I had the best sleep last night and today I have no pain and I'm standing straight! Thank you so much Dani "Posturehands", you are amazing!!!! Everyone needs to try rolfing at least once to experience this amazing treatment, I can't say enough!" "Dani is nothing short of amazing, she is a remarkable woman with a love and passion for what she is doing to help others. I had never heard of Rolfing before, and didn’t know what to expect at my first session. The difference she made was incredible. I work all day at a desk, which is hard on my back and shoulders, I was also preparing for our wedding so my stress level was definitely high. I left the appointment feeling better than I had in months (maybe even years) and I couldn’t believe the transformation after just 90min. My shoulders were visibly lower, the tension was released from the joints in my upper body, my posture felt better and there was little to no pain in my shoulders due to stress-tension. I recommend Dani Reid for Rolfing Therapy to anyone who lives with any pain or discomfort." " After years of being hunched over books studying and now a work computer screen, it is no wonder my shoulders were tilted inward, highlighting my imperfect posture. It was not until Dani began to practice body structural integration that I realized there could be more I could do for my posture than try to consciously remind myself to push my shoulders back. The tension released in my shoulders was therapeutic and Dani worked until the result was vivid. Not only did she help improve my posture but released tension and areas of deep myofascial tufts that I did not realize had also developed over the years. I would recommend structural integration with Dani to anyone else who needs to press the refresh button on their posture like I did. " " Since my accident over 4 years ago, my neck and shoulders were a constant source of pain. I thought I had tried it all (chiro, massages) until heard about Dani's work. I can't believe the relief and results I saw after only one session. This should be the standard treatment after any automobile accident. I wish I had heard about this sooner. Don't wait if you are in pain. Thanks Dani"
Half-way through Justin's session. Can you notice the difference between sides?
" I had been living in chronic pain for over 20 years due to throwing my back out. Before I tried Dani's services I was taking 2-4 advils a day, as well as constantly having to get off my feet and rest every few hours. I tried a few massage therapy and chiropractic sessions over the years with short term results. Half the time I don't remember what this therapy is called that you do, all I know is it works. Within only two sessions with Dani, my chronic pain was GONE. It's been 9 months so far of living pain free. Thank you from both of us. " Felt amazing after the first visit! Have notice a change in the way that my frame is starting to return to the way that it should be. Better range of motion and freedom of movement. Definitely would recommend to anyone. Too bad the review only goes to 5 stars. Thanks again Dani!
" I had no idea what to expect going in to my first session with Dani, and to say I was thoroughly impressed with my results would be an understatement. I had been living with chronic neck and shoulder pain that was making my job as a yoga teacher difficult. Not only did I see dramatic physical change in my posture, but I also had noticed a large increase in my ability to execute poses properly. Thanks for your help Dani!